The first thing she did was hire packers and then project managers to oversee jobs. Clients felt at ease as they saw the same faces present to assist them packing and organizing their possessions, she said. The range of services Kavanaugh provided continued to grow along with her staffing. There are more than 20 employees now and she expands staff month to month. She said the job requirements are a commitment to a minimum of two days a week, for five hours each, and the qualities of compassion and patience. Two years ago Kavanaugh franchised the business with offices in Saratoga Springs and Charleston, S.C., plus headquarters in Delmar. 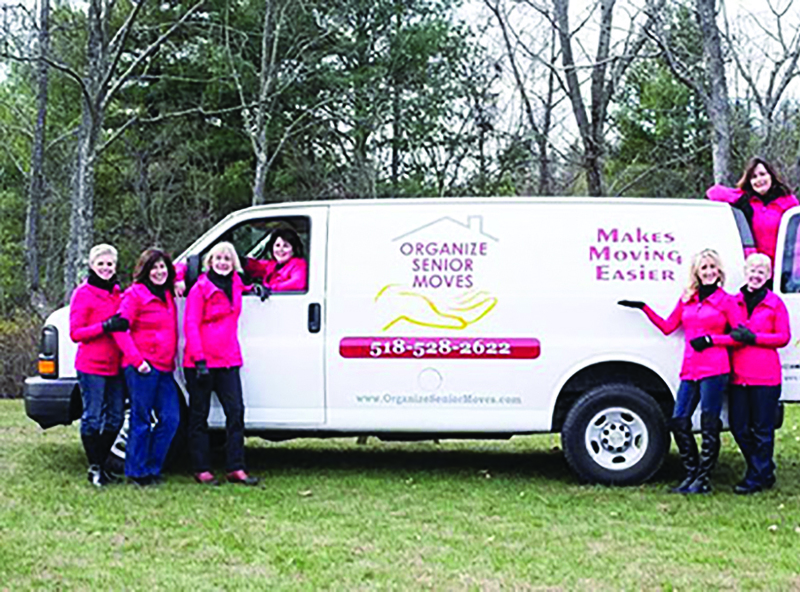 Organize Senior Moves has since topped the 1,000 client mark. “Our mission is to provide care and trust during this emotional time of transition with compassion, integrity and knowledge,” she said. The business does not include a real estate agency, moving company, antique dealership, or auction house. But these are the kinds of expert services clients may need and Organize Senior Moves can organize and oversee to accomplish the client’s goals. “If I can’t help the client, I will find a trusted resource I have experience with who is fully insured to do the job,” Kavanaugh said. She and her staff are the “senior mover managers” who either perform or oversee every aspect of moving. That includes downsizing, selling a home and setting up the new location so that “when they walk through the door, everything is in place and they immediately feel at home,” she said. Part of the service is working with real estate agents so that the senior move is timely and efficient. Kavanaugh makes sure everyone involved is feeling comfortable about the impending move, including a client’s adult children. She starts the process with a one-hour, free consultation going through everything the service can do. Among the questions Kavanaugh poses are: Who is going to help with the move? Are the children local? Do they know which personal items they will want to take possession of? What is the desired time frame? Working with the different personalities and attitudes of family members can be challenging, which is why the first order of business is to get all involved and determine the best way to communicate as a team. Then she leaves the attendees with a client package that reiterates the company’s four-step process. Any family member who wants one may have a copy of this package, she said. First step is to design a layout of the new space so Kavanaugh can recommend what items will need to be moved or purchased. The next step, downsizing, deals with whatever items remain. If the client and family want to have an estate sale, Kavanaugh will arrange it. The team is aware of these challenges and is sympathetic to each client’s concerns. Kavanaugh oversees the movers. When the senior comes home the beds are made, the kitchen is set up, bathroom linens are on the racks, pictures are hung, and furniture has been arranged according to a plan to optimize the space.